Sri Mata Amritananadamayi, popularly known as Amma, India's Hugging Saint, is the embodiment of universal love, . She is an Indian spiritual leader revered as a saint by her followers. She is widely respected for her humanitarian activities. Without getting married, without giving birth, She has become known as the Mother of all. She was born with a beaming smile on her face, in a poor fishing village of Parayakadavu in Kollam, Kerala, Southern India, in September 1953. Her parents named her as Sudhamani, and she had only primary education. From a very early age, Sudhamani was drawn to spirituality and wanted to reach out, to comfort and uplift those who were in pain. People soon began to notice the extraoridinary and unconditional love that she radiated towards everyone who came to her. In 1975, during a religious reading in the neighborhood, Sudhamani had a vision and showed her 'Krishna Bhava'. 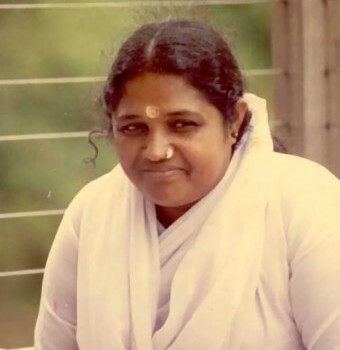 Gradually, she started a small seaside ashram at Vallikkavu, which is now grown and known as Amritanandamayi Math, and began to be known as Amma by her followers. In 1981, Amma's first spiritual center was established in Amritapuri, Kerala. In 1987, Amma first traveled to the United States and subsequently her followers came from many parts of the world like Canada, Europe, Middle East, Asia, Australia and Africa. She is also known as "hugging saint" by the people. The people who come for a darshan of her are from all walks of life and from all religious backgrounds. Whatever number of people come to her, she will not leave until she has hugged all who seek her embrace. Amma says, "Compassion to the poor and the needy is our duty to God." These are not mere words. Through her own life, Amma has inspired people from all over the world to walk in the path of selfless-service and compassion towards all beings. Amma is the founder of the Mata Amritanandamayi Mission Trust, which carries out various kinds of philanthropic activities. She has a huge number of followers not only in India, but also in many parts of the world. The Indian saint embraces all the people who come to meet her and at free public gatherings, known as "darshan" - young, old, rich, poor, men, women - all people. During her visits abroad, she would conduct series of public programs and retreats, and hug thousands of her followers. Amrita Institute of Medical Sciences in Edapally, Cochin is a world famous Hospital, where the poor could receive the very best medical care possible from highly skilled physicians and nurses, and in an atmosphere of love andcompassion. In 1993, Amma was one of the three people who represented Hinduism at the Parliament of the World's Religions in Chicago. In 2002, she was invited as the central speaker at The Global Peace Initiative of Women Religious and Spiritual Leaders, held in Geneva. In 2002, Amritanandamayi won the Gandhi- King Award for Non-violence. Mata Amritanandamayi (Amma) has become the Spiritual Master — the centre of the universe, the life force, the guiding light — for millions. The small village between the backwaters and the Arabian Sea, where she was born, has become the centre of a silent spiritual revolution now. Amma's Birthday on September 27th. 1. "There is no difference between the Creator and creation, just as there is no difference between the ocean and its waves." 2. "To awaken spiritual unity-and to spread to others the love that is our inherent nature-is the true goal of human life." 3. "A real yogi is the one who can maintain a peaceful mind in the midst of any crisis." 4. "Instead of using a magnifying glass to look at others' faults, use a mirror to look at your own." 5. "Everything in Nature has a purpose to fulfill. There are no mistakes in creation." 6. "Our duty towards God is compassion and love towards poor and needy." 7. "We should never forget that after every night, there is a dawn. We should never lose our optimistic faith." 8. "We are not afraid of death. We are afraid of the loss we will incur when we die." 9. "Past is over. What is needed is to mould the future by surrendering everything to God." 10. "Whenever you get angry, you lose energy through every pore of your body." Amma's official websites Amritapuri.org and - Amma.org.